For Villanova track runner, Brian Basili a junior from South Orange, N.J., there is a little more to that answer than just picking ourselves back up. Last Friday at the Colonial Relays in Williamsburg, Va., hosted by William & Mary College, Basili competed in the 3000-meter steeplechase, a seven and half lap race that requires runners to hurdle over barriers, one of which includes a water pit. On the third-to-last barrier, Basili fell hard, breaking his arm in the process. “The first thing I thought of was to just get back up,” said the first-time steepler, his left arm snug in a sling. Not only did Basili pick himself back up, but he kept running. He cleared the water pit, then the final barrier. And 250 painful meters later, Basili won the race with his visibly broken arm flailing behind him. While he may not be Batman, I think it is safe to say that he is still a superhero. Upon getting up, Basili did not realize that his arm had broken, perhaps, a common side effect of superhuman strength. The determined runner was committed to winning the race and going for the qualifying standard for the Big East Championships. Basili competed in the second of two heats of the steeplechase and maintained good position in the early goings of the race. With about three laps remaining, he took charge and opened up a solid lead on the field. And he did hold it together—well, except for the arm. Basili hit the barrier first with his lead leg and catapulted forward with his other leg trailing behind before crashing on his arm. The crowd bellowed a collective and horrified “Oh,” but Basili popped right back up. O’Sullivan admits that, like Basili, he initially did not realize his athlete’s arm was broken. As Basili rounded the final turn, spectators could see the full profile of his jelly-like arm. It was obviously broken. No one was laughing at the wounded warrior. Basili’s teammates reported seeing his arm rotate a whole 360 degrees as he leaped over the next barrier. Several spectators even shouted at him to stop, but with just a few more meters to the finish, nothing could break his trance-like focus. Basili crossed the finish line in first place in a time of 9:20.10, over four seconds ahead of the second-place runner from Big Five rival St. Joseph’s University. Upon finishing, Basili was told to lie down on the track to wait for an ambulance. His biggest concern, however, was not his mangled arm but rather finishing in time to meet the Big East Championships qualifying standard. “Did I get it? Did I get?” he shouted. He got it…by nearly five seconds. Basili said that he finally realized the severity of the situation while lying on the ground. Amazingly, it was not until then that Basili finally felt the throbbing pain that would have caused a lesser runner to drop out of the race. But Basili says he could never see himself doing such a thing. 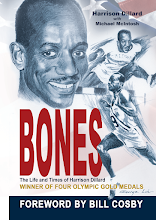 He attributes his unparallel courage and determination to his days at Columbia High School in Maplewood, N.J., under Coach Miriam Jackson. “She always taught me that you never drop out of a race unless your leg is broken,” Basili said, smiling. Well, at least we know he draws the line somewhere. Shawn Keane, Villanova’s athletic trainer for track and field, was one of the first to the scene. Keane (who has been with the Wildcats for three years) and the other staff on hand wrapped Basili’s arm, preparing him for the ambulance. Basili left the track to a standing ovation from those in attendance. But the story did not end there. News of Basili’s heroic finish spread quickly throughout the track and field world. Basili’s Facebook page blew up with words of praise and support. Meanwhile, 330 miles away, Basili’s teammate Matthew Kane, who had just heard the news, was set to compete at Princeton University in the 10,000 meter. Kane says toward the end of his race, when things got difficult he looked to Basili’s race to help carry him through rest of the way. “I said to myself, ‘Basili won his race with a broken arm today, I have to be tough like him’,” Kane said. Kane went on to post one of the top times in the region, dropping 35 seconds from his previous personal best. Soon after, every major running website and blog picked up the story and featured it on their homepage. Basili, the steepler that could, became an overnight inspiration in the world of collegiate track and field, prompting an endless number of comments and support from both friends and strangers all across the country. Basili said the overwhelming support he has received has helped him keep a positive attitude and has strengthened his confidence in a speedy recovery. “It’s definitely an honor,” Basili said. “I appreciate all the things that people have said. It means a lot." Though injured for now, Basili is optimistic about competing in another steeplechase next season. Basili is scheduled to have surgery on his arm this afternoon. Doctors plan to put in two screws and a plate to repair the arm. The good news is that Basili should be back running in about three weeks. While the road to recovery may be a tough one, Basili knows that this is one barrier he can overcome. 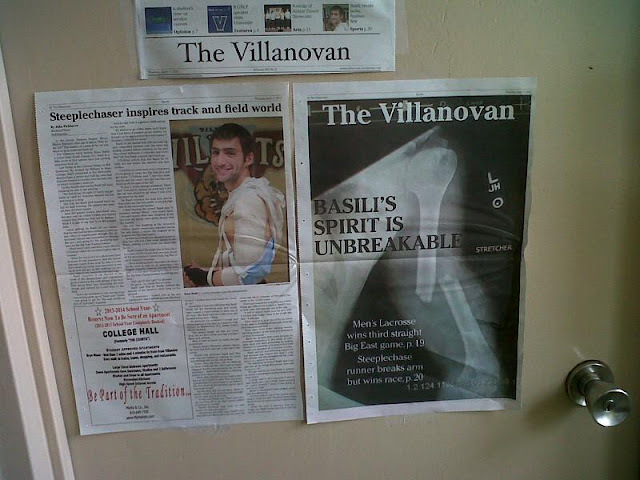 Addendum: Here a photo of the X-ray of Brian Basili's left arm, as it appreared on the cover of Villanova's student newspaper.